Alternative, low-cost, easy to install products to end costly to repair engine, gear, coolant, and steering problems. Not for every car and truck owner, however... these new tune, repair options are providing for some, a better way to end their performance problems. Like bitter medicine, but to restore your ailing vehicle's health. Additives, like grandma's bitter remedy, are one of the most underutilized car care weapons for the car, diesel truck owner. This site explains what additives work to use, and what ones cause harm - to avoid .... to see if an additive - will ... end your wear and tear problems - so costly to actually repair. "3 times we took the transmission apart to get it to shift right. So we tried your method and it made it shift beautifully. The products and methods recommended for your fix, are special conditioners with anti-wear qualities that clean and smooth rough, fast wearing pistons, bearings, gears, valve assemblies - promoting additional years of dependability. HOW you, your family & vehicles benefit. Here’s the run-down. Training mechanics who want HOW best TO USE SPECIFIC additives for their customers best repair results, in all this. So why wouldn’t you want to spend 10 minutes reading around the site to benefit from this option? Start by reading the rest of this page..
...showing why and what specific page will fix - or end your fuel, engine, transmission, radiator, steering or a/c problem - faster, cheaper, better. ...these are my tune and repair options - the medicine I use to fix my, and my customers automotive mechanical problems chemically. have or are using my options - as the fix, avoiding repair, or at the least, putting it off for many years, as I will show you to do as your read along. How this option works to fix the car. This option is that medicine to end your dirty internal, upsetting engine, transmission, radiator, steering, or a/c running, noise, wear, mileage shift, leak, and such problems - and restore your vehicles most healthiest, long term state! Products most mechanics badmouth and new car dealers won't sell. They are trained to fix cars, or sell you a new one - not keep them going economically. I know! I'm a mechanic who worked 8 years in car dealerships. Does my option always Work? Yes - as you will soon see, and it avoids repair! Or gets ready for repair ... by medicine to get every part working great again, using this option to isolate the broken part. See what customers say about their fix, below. You will use what I call problem-solving chemistry - package to clean and free the troubled parts, then smooth out, so to end your car truck tractor boat motorcycle problem - ending the problem, permanently. I'll show you the exact option you need on the page I'll send you to., below. But in older worn vehicles, additional features reverses the dirty rough condition so they return a clean, freely moving, and smooth, operation to your car truck, ending or removing the friction and dirty negatives causing your car truck problem. That's a good option for you, wouldn't you say so? No longer a need for yanking out and replacing those few internal, trouble-causing parts with its costly to do by hand expense. And the best part is once you experience this option you will have the recipe to stop or end all other avoidable wear troubles. What results is a stronger running, quiet operation you will enjoy, that seems as if you have a bigger motor, yet adds 20 to 40 more miles distances to each weeks tank of fuel. How this option product does so. By circulating or crawling to the trouble spot - after you install it as shown, it reverses your engine gear etc., negative state - as you drive, ending the running, tap, sludge, blowby, rough shift, leak and any such. - Guaranteed! Men and women car and equipment owners get professional results, not just mechanics using this option. Any car or diesel truck - boat RV or motorcycle, engine, transmission, radiator, or steering problem immediately. Enjoy a good-as-new after our fix - which is proving to be a cheaper, faster, with longer lasting fix or free to you for trying. Anyone can do the fix, nothing to take apart. Made easy, and done as you drive, as driving caused the problem, and this option reverses the damage, to end any wear and tear problem. See what customers say, below. Spend 10 minutes learning how this method of car and truck care will pay you all your life! Easily understood and with directions and specific products to order needed. Read a few pages here and there to understand. Results recovers your car or diesel truck tractor boat motorcycle or machine performance at much lower expense, yet avoids avoidable trouble in the future for years to come. in an easy-to-install manner, nothing to take apart. Just add and drive. Driving does the fix. or no cost if it takes repair to do the fix, instead. I'm a mechanic, and the country's expert in all this to help you. You will learn about a smart Hi-tech Anti-wear Car Truck Care Service and Products from Mega Power that offers the benefit you're after. Those are some of the options and the page your fix is covered details why they work! I'll show you How to install the specific fix for your car need! to extend the life of every engines transmissions radiators steering systems. Our tune repair option - the fix, for internal engine transmission radiator and steering problems surprises vehicle owners. With a high success rate, and few refund request, we decided to offer a refund to skeptical motorist if the fix suggested fails. Ends your wear and tear problem - or your money cheerfully refunded. Please note: 2 refunds ask for last 267 days. How new repair options and products are giving car and truck owners a better tuning and repair option - cutting in half cost and repair time. Interested? if so spend a few days reading around the site. Then order whats suggested. Read mikes auto tune repair option experience. See the demo that teaches the option working secret to mechanics. Click other blue links to search out your fix. The tune up repair option with new solutions to end your car problem. Our similar advice also uses medicine and vitamins made for cars ...to heal and end your car truck tractor boat Rv and motorcycle's engine transmission radiator and steering system problem. Tens of thousands of us already have done so! Why not you? Your tune repair option: guaranteed to do as advertised - or no charge for trying! Even if older, even if well worn? This option does that for you! The common repair method returns your vehicle back to the way it was just before the problem. With other problems growing. Our option returns your vehicle back, not the way it was ... before the problem happened. No! But to a near new state of operation. And that option works in every component, not just the engine, but in every component you want that advantages to. This tune repair option re-conditions every half worn part afterwards so it operates as if new! This auto tune up and repair option is the best tune up possible for free! Does both the fix, and revitalization for a fraction of the cost of common repair methods - which cannot revitalize. What also is fixed by our tune repair option advantage is your vehicle will run again just as it did when newer with no trouble brewing, by removing existing troubles brewing no other option has as a fix. This option is faster, cheaper, an offers significantly longer lasting result benefits. Join those of us who are enjoying Those Superior Car and Equipment Tune and Repair Results - With This Repair Option. I'll explain and show you, so you can do the same. The products shown to do all that for you are called wear-and-tear problem solvers. But recommended as your fix! They work because they reverse the problem internally causing your car problem! Special conditioners clean and smooth, gummy, wear-roughen, trouble-causing wearing pistons, valves, bearings, gears. After hose negatives are removed... they return your car, pickup diesel truck tractor RV boat and motorcycle operation back to its former, great running state - promoting additional years of trouble-free dependability, again. That is what you really want and your best auto-tune-up-and-repair-option. How to quickly find your auto-tune-up-and-repair-options.com fix. Get started signing up for our newsletter and its entree into this better cheaper tune and repair option site. It's below you will come to its sign up form. Next... Read below to understand what they do and how to use them to get your car or truck up running great quickly. .NEW METHODS AND NEW PRODUCTS FOR ENDING YOUR VEHICLES PROBLEM FASTER BETTER CHEAPER. MADE EASY. How easy? How less expensive? Just add what's shown on the page for your vehicle problem, add what's shown and drive. Driving does the fix! That's How new products from science and chemistry - end engine transmission or other component mechanical problems causing your trouble - and for a fraction of repair cost. How chemicals fix wear and tear problems. What they contain other products do not have - so won't work! They do so with un-common additives like carbon removers, friction modifiers, metal conditioners, and co-polymers - all fix the problem or end it. Just not sold on the open market. I discovered them trying to get my own cars and equipment - what I felt was a premature problem fix in a better cheaper way. And, I'm a mechanic. But I also want things to save time and money with. Perhaps extend the life of vehicle I'm heavily invested in - like you. These problem-solving products end any internal trouble by reversing the wear causing problem. That's the fix - with a tune up like performance afterwards. Not just any product or additive, but those hard to understand and select - made easy - if you know their secret to do so! That option as a fix offer a superior method of maintenance to end your wear and tear running, tap, sludge, hard shift, and such problems, with me making it easy for you to do! Shown on the page your problem is headlined - below! Your auto tune-up-and repair-options.com makes it cheaper, faster better than anything else. And, I'm a mechanic, who wants the same shortcuts that for you avoid roadside breakdowns, expensive repairs, and that cause years premature need for vehicle or truck replacements, just like you do. Here explained so you understand them and their power to have you quickly get back to life's highway in the cheapest, quickest, best resulting way. That's your auto-tune-up-and-repair-options.com purpose. You, like us can install these particular additives as your repair option. They work 95 out of 100 times! If you find repair still needed I'll refund your money back! But, few ask... Why? Its because the fix additive option given reconditions and revitalizes. If repair is needed our additive option helps by cleaning and freeing all the other parts not replaced. Then a tune up feel results when all the half-worn internal parts are cleaned up and worn-away surfaces smoothed, and filled with a co-polymer. So older parts not replaces run and last as long as new parts installed. That is a great option and why no one ask for a refund due to that benefit! As you will see your tune and repair option has many advantages that make them cheaper faster, and better than any repair can. You are shown that option as your repair option. If repair is needed, the bad part shows up like a bad penny. Fewer parts will be junked out! And those remaining half-worn, trouble-brewing parts not replaced, will last as long as those failed parts. replaced during repair. It will work the same with the same tune repair result we gain, so your cars operate as if new, as the fix result, too! OK! You now understand why Google listed us for you to find. Auto tune up and repair addivitives even a gal can use to end engine transmission problems. say most people and mechanics! You can't fix broken or failed parts with any additive! That's true, you can't! What slows down their failure? Our option specifically addresses and removes those sluggish, binding from friction and tar-like residue - negatives. Stopping their growing intensity causing years sooner demise and failure. So, your auto and repair option treats those about-to-fail parts so they operate as if much newer, clean and freely operating, and coated with co-polymers in the treatment to fill up their worn spaces. You will notice from this option an instant power and performance improvement; already at work in thousands of older worn out, and in need of repair cars and trucks so treated. And some I torn down for inspection and repair years later, that were clean and every part freely operating - showing our additive options did as advertised. And from customer testimonials saying they felt that is what worked to end their engine and gear problem their cars and diesels had. And there is this advantage: the engine transmission will run a noticeable better due to the chemical re-conditioning. Better is what you're after for longer life. Your option is guaranteed to end the problem because 95 out of 100 times no parts have failed! By this option choice, you are chemically removing negatives from what years of driving the cause, too! Us mechanics don't clean up, we just chunk all related parts and add new ones - who cares - you pay the bill unknowingly. And with replacing - every other part; seal, gasket, sensor gain the same like-new-again advantage from such at $2500 to $5000 expense.. Your using our option to end your car engine transmission binding, wear, residue performance trouble will have your car or rig also run "tuned up" as if new-er by removing its binding, wear, residue performance trouble. Do you want that feel from your repair? That is a WOW factor just replacing such parts can't provide! Only what we show you to do and install! Tens of thousands have already followed this guaranteed to work, auto-tune-up-and-repair-option.com fix ~ option. 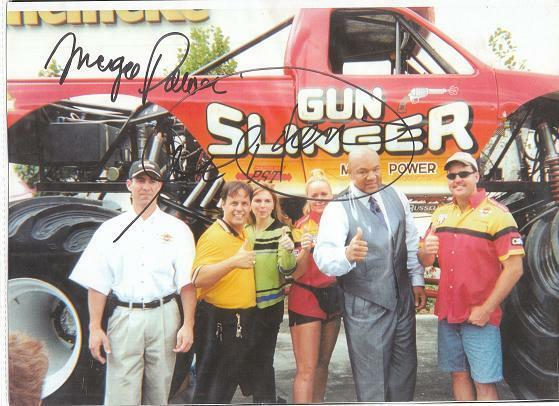 Mega Power Engine Treatments For George Foreman and Truck Gun Slinger. Not just a older worn car reactor treatment. Many folks afterwards, with new expensive vehicles, and costly good-running trucks and tractors add these same conditioners as the best way to care for and keep all their good running vehicles protected for years longer. Worn and new ones, both!I do, too! This option is made for and will prevent over 21 problems. Below, you'll be shown the page to go to with your fix details on it. And good vehicle prevention care your fix provides your good running vehicles. The products and methods recommended for your fix, work because special conditioners clean and smooth, gummy, wear-roughen, trouble-causing wearing pistons, valves, bearings, gears. Those negatives removed... return your car, pickup diesel truck tractor RV boat and motorcycle operation back to its former, great running state - promoting additional years of trouble-free dependability, again. That is what we call your best auto-tune-up-and-repair-option. All our options come with a no-risk for trying, money-back, if not satisfied with results. guarantee! In a sense this option pays you as it cuts actual repair cost -using additives we discovered to do so. Those are 2 benefits you and your family can use. Read more below details given of your auto-tune-up-and-repair-option page we recommend you read over, then order our fix for your vehicle problem. Today, order and install the option on the page your car trouble is listed as your method to reduce your repair cost from many thousands to just hundreds. You can do so with the easy method I'll show you - to always use when having internal car or equipment problems, an ending this present problem. If you want the return of the brand new zippy, powerful, yet economical running, and dependable feel your car or equipment had when new, this is the only place to get it - along with ending its present problem! Learn More. Fix More. Save More! Its all here with a quick education with easy How to's. For myself, and now you! From early in life, I noticed auto repairs did not offer the brand new zippy, powerful, yet economical running, and dependable feel your car or equipment had when new. So I set out on a course to see who had it, get it, and why the difference. I'm the country's expert in all this. That's my option for you here! what's new and better to end their car, pickup, diesel truck, tractor, RV, boat, or motorcycle running problem. and at the same time clean, smooth, and protect all the other half worn parts so they work as good as new ones, so every part has a "good as new" performance and longest life, too! Your option, the fix, cover your engine transmission radiator and steering running, performance, High mileage remedies. I'll show you yours. Did you know every 95 out of 100 major repairs have no internal broken parts. Just dirty conditions and friction problems which are cleaned up, or replaced. Running up repair cost from $3000 to $5000. Now, since dirty conditions start most problems, products I call Treatments, "the auto tune up and repair option," can clean, heal, smooth and even fill worn spaces - which ends your problems chemically. Either way, you'll have a vehicle that runs totally amazing better! Keep it running that way as long as you want into the future. Do so for a fraction of old fashion repair cost. Under $500 for big rigs. Under $100 for cars. No cost if you fill it did not do those things for you. 2 refunds last 267 days. You will install your auto tune up and repair option to restore your cars great trouble free condition; and the only place to help you do so. Just add what's shown and drive. With driving, you will end your car troubles, get on with life, smarter, and with more of your budget intact. Lifter and valve tapping. Carbon Knock. Mysterious stalling. Lousy fuel economy. Loss of power. Hi-mileage boosters. Rough shift, gear slippage, steering whine. Overheating, leaks -gaskets, seals, holes. And hundreds more are all covered to fixed cheaper, faster better, our way to help you. Easy for any man, women, mechanic! All my life, I've look for the exceptional way to do things better - not the ordinary. To avoid avoidable problems in the future. I think that's the best way to live. You can do the same - with these faster, better, cheaper, years longer lasting options! To do so.,.. I'll show you how! I'm a mechanic and teach repair shop owners and just plain men and women car and equipment owners who want - this method. We both prosper off the results. There should be tips, products and help for people like us but there were few, hard to find. I found them! You will enjoy more out of life, including more value from your transportation dollar. For you to do so, I'll show you what I learned so you can be wiser in this area of life, too. These are add and drive to fix problem solvers. If your idea is to avoid costly car and equipment problems that creep into life prematurely, by doing more now to prevent them, or push their repair years into the future, the info on the page your remedy is considered explains it all. I'm a mechanic, yet I want this option working for me and my family's better well being. And yours! To use such car care methods you will learn to use certain additives found to do so explained. They help me, and now you avoid tens of thousands of dollars in now avoidable repairs and premature replacement - I used to have to live with. That's makes more money available for my family benefit. As a mechanic, I apply the same car repair advantages so my customers benefits for my expertise in all this. Its more than just a job, its helping them have a better life from my car care and repair philosophy. Its what I'll direct you to in a minute. I found a way to profit from my car care and repair philosophy showing other mechanics, who own their own shop how to profit more personally, and in business doing the same. This web site gives what I call recipes for hundreds of car and truck tune up and repair options. It is also the inside part of the repair - you can install, the mechanics now skip - their customers loses out on. You now will benefit from years of field testing and usage I've done to find the best short cut methods, products, to end your car trouble. My auto-tune-up-and-repair-options will quickly, and economically have your car or truck back up running great again, better than actual repair - and you can gain the same long term fix benefits I'm talking about! Even serious engine transmission radiator, steering and a/c problems all have a hidden alternative fix - that's cheaper, faster to end the problem better than actual repair. I'll show you that fix to end your vehicle, equipment trouble and have it run better, stronger than ever! You may be wondering, What is it? Tens of thousands of motorist already use our auto-tune-up-and-repair-options.com chemical fixes to fix mechanical problems. So can you! Like valve tap, oil burning, rough shift, leaks and such power upsetting negatives with new, better product solutions, and simpler ways to end such complex negatives. That's why its the Best Cheapest Fastest Repair Option around to return your car back to normal, the same day. This option allows you to keep more of your hard earn money in your pocket - not others. Spend 10 minutes to read about our auto-tune up-and repair-option.com fix solution through, order what's shown on that page, install it, get on with life. Learn More earn More. Save More! Its all here with a quick education, designed by a mechanic to help mechanics see what's new, to expand their car care, repair expertise and income. But written for you to understand your car pickup diesel truck tractor, RV boat or motorcycle new way to end your car equipment engine transmission radiator steering and drive train problem. and many other negative conditions. So our remedy for those conditions are treatments that clean free condition smooth and fill worn surfaces. That cleaning freeing conditioning smoothing and filling of worn surfaces return your pistons, bearings valves gears and such back to clean smooth strong operation again -ending the above problems. Serious vehicle problems end like valve tap, oil burning, rough shift, leaks with new better products and simpler ways to do so. Here Is How My Knowledge and my site auto-tune-up-and-repair-options Will Help You! Look for links on this page and - or buttons on the left listing the problem or problem component you want help with. Read a few pages to learn a little about car care an avoiding such problems - and our remedy you can order there, or by calling me. Look over, click the buttons on the left for help. NEXT, Click a few buttons or links below just to read and learn this new car care method. Scan titles of Table of Contents at bottom of page. Call me, for help if its all to much. "America's Automotive Care and Repair Shortcut Expert to help you." I'm a mechanic, and teach mechanics, and just plain men and women vehicle owners, perhaps like you, these alternative options that do the fix chemically. That's our auto tune up and repair options. 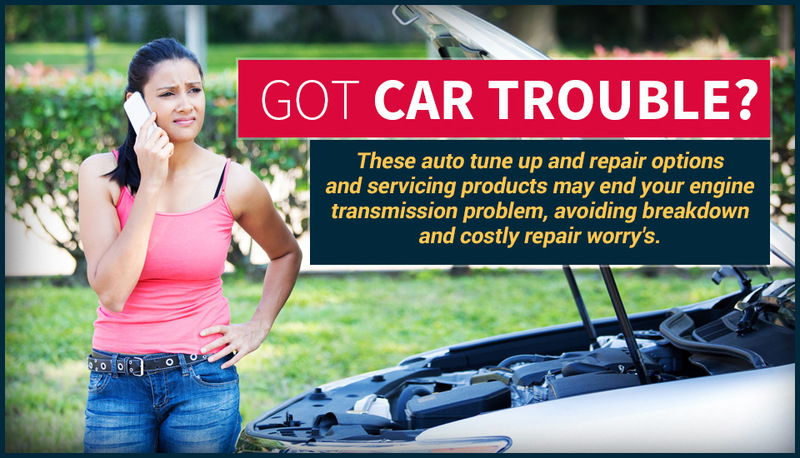 You will gain the best tune up and repair options, to end your car troubles, get on with life, smarter, and with more of your budget intact from with my auto-tune-up-and-repair-options.com. I'm sure our repair options are what you're after! Because the tips, help, products are the best to help you and your family all your life solve wear and tear problems faster and better, and also have better running vehicles, lasting years longer. The way we do it seems odd at first by correcting your vehicles seemingly mechanical problem, chemically, but it does so reversing How your car trouble started and it goes away! That's not odd! It's a better way to fix cars. 10's of thousands already have done so! What's odd if you took a thousand motors apart like we did and found perfectly good, but dirty parts causing 99 out of 100 repair problems. Actually, its because acids, friction, and sticky residues made the good parts falter, bind, or slow their operation to seem like they failed, were broken, wore out when they were not! That's what your fix removes! Since driving caused your problem, instead of repair, we have chemistry that cleans up, reconditions, and chemically rebuilds those troublesome areas, all reversing the problem back to normal - ending it. The option we selected works as you drive! Driving caused the negative. Driving ends it. That's our auto-tune-up-and-repair-option.com repair. Click a few pages just to read and learn. You will soon be breezing down life's highway smiling, with a new found budget saving, repair avoiding best method of car care known! This is empowerment - knowing you found the best, cheapest fastest way to fix, care for, and avoid vehicle problems - few know. All exactly the auto tune up and repair options you need. With just 2 refunds the last 267 days, you have one more option going for you! Doing So by men and women who don't know a gas cap from and exhaust tip!n tens of thousands of cars pickups diesel trucks tractors RV's boats and motorcycles - no matter! By ending mechanical problems chemically. Makes no difference of brand, size, if new, in or out of warranty, older, Hi-mileage, even worn out! How can that be so, you may wonder? It's simple, once you know the secret I, and tens of thousands have learned - and I'll tell you. After repairing hundreds of engines, transmissions and other components, you rarely find a broken part! Instead, you find crud, residues, and friction everywhere, but gumming up and bogging down just a few parts. Those few gummed up parts are causing all tap, oil burn, blowby, rough shift, leak, or whine, performance, running problems and the trouble. Can remove the crud, residues, and friction everywhere on every part, chemically. That is gumming up and bogging down a few parts that are causing all the trouble. To end tapping, oil burning, blowby, rough shift, leak, or whine, performance, or running problems. And make cars and expensive equipment running as if worn out - when they are not! Run as if near new again! That's the auto-tune-up-and-repair-options.com option I want you to try. You're with me the expert and here to help you understand the alternative repair for your problem. See how what we've learned, so you can do the same, better, faster, cheaper. That's the option here you are after - I hope! Of course, if its broken check out web sites that cover part replacement. Here we prevent that need. The problem you're experiencing explained. Where the problem is located. Good and harmful products to consider, or avoid. How our choice ends your problem in a cheaper, faster, better way chemically. How to use the same product and info to prevent avoidable problems in your good running cars. Tips and methods of care the whole family will use - to end up with better running, years longer lasting vehicles and equipment. The following is an accumulation of what people ask me, answers, what they experience. Techie How to's, how chemicals do the fix. All that boring stuff. The trouble solving internal car trouble is over. New faster better options to end them yourself I'll show you. I'm here to help you in several ways with new options to end your car negative, end its worry, help you get on with life. No wrenches needed. You have going for you the nets expert, and with years of street repair experience of what works, what to avoid doing. You, and teaching thousands of mechanics and shop owners these options, those I learned from researchers and product solution inventors, will be repair shortcuts few know. This will help you will understand your vehicle problem and remedy better than most mechanics, and end it yourself chemically with my help right beside you. 95 out of 100 running, performance, wear and tear problems are not caused by broken parts. Just dirty, bog down operating parts chemistry inside products can now correct, from a company called Mega Power. I'm the expert on additives - and I can say, their additives have become the cheapest, fastest, best way to get a car pickup diesel truck tractor RV boat, motorcycle going strong and good as new, and that I'll show you to do. See what Mike raves about after trying these auto tune up and repair options. While this site is to teach mechanics what's new, and how to add that info to their repair expertise and growing income making ability, every 5th or so purchaser is a women who doesn't know a gas cap for and exhaust pipe - but fixes her car following my recipe for it. So can you. And I'm nearby by phone to help you if needed. While all sold is guaranteed to do as advertise, only a couple a year ask for a refund - if actual repair is needed, because of the product advantages, help, and long term wisdom to reduce future avoidable problems given. The fix product is also purchased to recondition all the half worn parts not replaced during repair. This makes older worn parts last as long as new parts. Imagine that good advantage going for you. A few minutes reading on different pages of why and how will make life better, and show you how to keep thousands of dollars in your pocket for your family's good, not make others wealthier by repairs. Click any engine, transmission, radiator, steering, an A/C button link on the left of concern. On the page you go to, products needed for your fix are explained, directions given for the product install, and ordering info will be on that page. The rest of this page is my brain working in print. read it if you dare. You start your motor, this time it knocking. You put it in gear, or notice there's a lag or sudden rough shift going into traffic. You rev the motor a few times to see if you can clear the problem like clearing your throat. You're driving along. suddenly there's some form of performance or operating problem as you drive along. You pull over, raise the hood to see what up. Matters not if its a race car, plain car, pickup, diesel rig, tractor, dozer, RV, boat, motorcycle, or generator. The problem is not visible. Its a under a maze of unknown parts hiding your engine transmission radiator. You wiggle a few to see if anythings loose. You restart your motor, warning lights appear. You drive a bit, then gingerly go on to work or home, hopping you'll make it. I know those problems! I've had those running, poor operating, shift and tapping troubles more than once! When I was young, I've tried additives that sounded promising. No change. And switch oil brands at oil changes to see if that helped. When I became a mechanic, I was trained to find and replace those troublesome parts. It's amazing expensive to tear apart your engine transmission and do that. I'm here to help you in several ways end your car negative and get on with life knowing how to avoid them and other avoidable car troubles. I'll show you what needed to end, or prepare it so cost to end by repair is cut in half - and end up with much longer lasting ca equipment that runs great years longer than what other gain. the needed fix option to return your car pickup diesel truck tractor boat RV motorcycle lousy operating performance to like new.... again! The mission and purpose of this auto tune up and repair options web site is to introduce to you new ways to solve an end your engine and power train wear and tear problems with products that end mechanical problems, chemically! My job is to help you find what you need and help you install it. Your car will end its trouble, run instantly great again, and you will now avoid costly avoidable repairs, and years to soon vehicle replacement. These auto tune up and repair options are reducing premature transportation repair and replacement by pushing them years into the future. And the benefit for you can be the shift of many thousands of dollars from avoidable repairs and premature vehicle replacement expense to more money now available for other family needs, sooner. Good options, right? One way these options are better, faster, cheaper and better is because they offer you a holistic approach to end your vehicle contributing causes of your car equipment problem. For the repair shop, this holistic approach lets you profit by adding value to your tune, repair service. No other way turns cars into racy, zippy enjoyable driving ones. You'll learn how this option cleans, smooths, heals and fills worn surfaces of troublesome working parts, end the problem upsetting performance. That is the fix you need! Such an options helps repaired vehicle worn parts last just as long as new parts will last. Customers will thank you for such by being loyal to you. The person looking for a better fix will find this tune up and repair option the holistic option maximizing a vehicles dependability, after ending its problem, helping it often doubling the vehicles remaining life. Click any engine, transmission, radiator, steering, an A/C button link on the left. On the page you go to, products needed are explained, directions given for their install, and ordering info will be on that page. Scanning the Table Of Contents at the very bottom. If you repaired as many engines and components as I have you would notice 95 out of 100 times mechanical problems are caused by dirty, and just partially worn, surface rough conditions. When dirty, just partially worn, rough conditions bind or slows piston bearing valve gear sensor movement. Those wear and tear negatives cause most mechanical operating, noise, power loss problems. if unnoticed, those conditions do wear out the trouble affected part faster, and then need replacement. Catch it before failure, you can avoid its repair. If you read the page your problem is covered, feel that it sounds like the fix, buy my recommendation and it does not fix it, send me the repair invoice and I'll refund your expense. @ refunds last 267 days. If it works I know you will follow my tips for service products from then on! Perhaps tell others about my auto tun up and repair options, so they can benefit from them. I found, that me, car buffs, thousands of repair shops, and just plain men and women I showed my out-of-a-can-fix to, containing special inventions of problem-solving cleaners, conditioners and protectors - I packaged as a treatment, ended such negatives. Do so by addition to the trouble causing component. And then do so by driving. Nothing to take a part! The following are the most popular problems fixed by my treatment. The fix returns the vehicle - no matter brand new with a problem, or considered worn out, to their former great like-new state chemically. I didn't invent them, Bud Esterline did! But I did became America's Expert in their usage. Order the needed fix option to return your car pickup diesel truck tractor boat RV motorcycle lousy operating performance to like new.... again! Over the years this cheaper, faster, better, out of a can - learning experience has elevated my car care repair expertise, and many see me as the country's expert in all this! You have the real source for help for fixing wear and tear problems out-of-a-can with my info. Not somebody just selling something for a buck! Not a miracle cure! They don't always work! If they don't after a fair trial time, it needs actual repair. It exposes the bad part, while reconditioning worn spaces. Those your mechanic ignores when replacing failed parts. He's hoping more fail soon so you return. Do you hope that? What else you should know about all this.! noise, tap, sludge, blowby, rough shift, leak, or other such internal caused vehicle problem chemically, with my option out of a can. OK! Let get to it! Do one of 3 things or all 3. If you came here, and have the following trouble, click on that link for their fix. Read the page. Have a question, call me. That's our option and using it can save you and your family thousands of dollars of now avoidable car repair and premature replacement expense. Money that will help you in other areas of family life that's needed! That's why this is a better, faster, cheaper option for you. End. Balance of page, former stories. Originally made to help new-cars and heavy-equipment "break-in smoothly, as a premature wear avoiding anti-wear aid. You'll find these wear and tear ending treatments - for out-of-warranty-vehicles with wear, problem-solving ability just what you need! It will help you this way. By cleaning, freeing, and revitalizing every part - The bad part then stands out as what needs to be replaced - reducing repair cost by 50% or more. With this auto tune up and repair option, either way I show you how You can clean, free, heal, and revitalize the half-worn parts so they last a second, trouble-free lifetime like the new parts will for you. hat's why our fix is your best, cheapest tune repair option you and your whole family will benefit from!. Unlike the common auto repair philosophy, which is to replace bad and half-worn parts as the fix - a $2000 to $6000 expense, this option is often the fix! It cost 1/5 the cost, and is instantly available. Or it exposes the bad items for replacement after reconditioning the half worn ones for a total new life of service. leak, or other such internal caused vehicle problem. This is what makes them better faster cheaper! They are, if for one thing, they fix your mechanical problems related to wear and tear, from radiator cap to gas cap and all in between. If you want a guaranteed way to do so that's better, faster, and 85% cheaper than actual repair. Because field testing showed they limit or stop negative conditions in an engine transmission or other system back to the way it use to run when newer. This avoids the repair need - is that a real value for you! If you already feel this is your possible fix remedy you add them as shown and drive - the fixing occurs that way. That part is simple. Several complex actions then reverse the negative conditions. Installed during engines and transmission repairs the car owner getting a repair is also provided reconditioning of parts not replaced. This extends half worn part life to match the life of new parts added. That value no oil or other brand of additive can provide. By presence of anti-wear as a means to stopping or limiting the problem cause this feature restores the original, like new zip, performance, and long term dependability - lost. Even in worn cars and equipment. Those features make them better, faster, cheaper and the best fix for you. Those with budget restraints appreciate the auto tune up and repair option suggested for their wear and tear fix. These auto tune up and repair options are the fix car makers, oil companies, and part stores, even most brain-washed mechanics trained by them - don't want you to know about! Car makers, part stores, and most mechanics want you to spend many thousands when a few hundred this way works equally well! You gain, my way! My way, the auto tune up and repair option for your fix is the poor man's alternative. Try it and see for yourself! Good oil is all your vehicles need! Additives can void your car warranty. Just follow the car equipment makers recommendations for servicing. Those statements, you might already suspect, hide-the-facts about car care and repair - your own experience on car care prove "not so!" Those people live in million dollar mansions, drive million dollar cars, send their kids to million dollar schools, have the rich and famous life style - while you and I spend 3 month of our income for their car care and repair methods. They lose money you avoid spending when you discover this repair avoidance fix, or way to push its repair need into the future. Doing so by removing the troublesome internal problem. Double equipment life at half your expense now! Upgrade your car care and repair expertise that will double you present income making ability. That's what these auto tune up and repair options are for. If they suit your taste for what beats the care and repair system bookmark this page. Read my explanations to see how to test them for yourself. Call me for tips advice or program for your needs, or my repair shop program. Do what I found beats their system of greed! Me and others took many years to discover these options. Many more enjoy and benefit by them. This site explains my proof for them. I hope for your part, I've made them better, and faster to understand and add as part of your every vehicle care and repair, or repair avoidance plan. Doing so will give you better performing vehicles, that last years longer than what any other method of care can do. The auto tune up and repair options immediate performance improvement of ending your problem is one proof. The mission and purpose of these auto tune up and repair options is to introduce and provide new ways to solve internal engine and power train wear and tear problems. These products are better, faster, cheaper for the repair shop and vehicle owner. One way these options are better, faster, cheaper and better is because they offer a holistic approach to end your vehicle problem in place of repair - as the repair. For the repair shop, they should become the inside holistic part of your tune, repair service that cleans, smooths, heals and fills worn surfaces of older parts not changed out, to help them last just as long as new parts will last. This holistic option maximizes a vehicles dependability, ending their problem , and often doubling the vehicles remaining life. Follow this page to learn how and steps... to do so. You will learn your problem cause, and the best remedy to end your problem - in place of repair. It also is the inside part of actual repair, for a superior repair. To do your option I'll show you products that clean, free, heal, smooth, and fill worn surfaces on every part - including trouble causing ones to end your car trouble! Profitable solutions for repair shops, and dealership parts and service departments. These options are profitable solutions for repair shops. And dealership parts and service departments. For even personal help for just plain men and women vehicles owners - all looking for the fastest help, cheapest, yet best fix for their vehicle problem now known! All on the page you go to for your fix. This Following explains why these repair options are much better for you, your budget, your vehicles long term problem solution. A quick education for the best fix your vehicles and your wallet can have. If you give me a few minutes and read this option page, then read a few other pages. To benefit you right now! Doing so with the best repair solution for them - and all your vehicles - and why not? The common way is costly. This option avoids that method for you. It promises that you gain a new, better long term fix, and performance, like a race car, and new-found driving enjoyment. You may, financially double your transportation money value now, helping your whole family from now on! That means less expense now, later too! It can mean, as a result of our auto tune up-and repair option you having more $ for other family needs. No one likes car or equipment engine or power train trouble. This option is different as your fix, as it provides you the best know - but hidden from you inside your motor and transmission, a long term repair solution, yet cheapest long tern car care and repair option known. It ends trouble that could leave you stranded, like the car owner in the picture. These tune repair and maintenance products fix such conditions. They are often cheaper, better options - if only you knew of them. Can they solve or end your car running problem? Yes! In this way. Most times they are the fix you can do yourself. Nothing to take apart. Just add as shown and drive. Driving then ends the problem and returns that component back to new like operation so you have your transportation up running great again. - Sounds amazing -right? How true is that statement? With a 95% success rate, and thousands using them, and only 2 refunds requested last 267 days, it proves to be true statement. Like all important things that require life's benefits from, a little education is needed. On this info page we introduce new, better, car care and repair options to check out and try. That requires explanation and proof for you to test with to end your vehicle problem. Like any knowledge of great and long term value, spend 10 or 15 minutes looking around the site to understand why this option is your fastest, cheapest best way to return your engine transmission radiator steering a/c, and such component trouble maker - and entire vehicle back to its great former, like-new dependable, state. That's our auto tune up and repair option for you! This option will keep thousands of dollars more of your money in your pocket, than greedy mechanics, parts stores, and car dealer pockets. This option will get your transportation back up to normal - However, the option offers a lot more than that as you will soon learn. Here's what I mean by that statement, "this option offers a lot more than a quick cheap fix," as you will soon learn. Here's why that's important to you and the tune repair fix google suggested you're after. Enemies known as oil companies, greedy mechanics, parts stores, and car dealers who profit off your ignorance of these options would rather you listen to them as experts. For you, this site is made as an online resource to train mechanics who want, and vehicle owners like you looking for such new better cheaper methods of car fixes and care. For repair shop owners, this site teaches why what's new works or should be avoided, This site educates and expand their expertise, offer more reasons for greater customer satisfaction, and opens new doors to greater income making opportunities. Have you on down the life's road smarter, more knowledgeable, knowing the cheapest, yet best way to lower repair cost, repair avoidance, to have this and all your vehicles run trouble-free again! You're provided one place with the best, fastest, cheapest, Do-it-yourself option to end your auto tune, repair and car servicing needs. Most running and performance problems only require these particular products added to fuel and oils or fluids to end them. To end your car equipment wear, running, noise, residue, oil burning, tapping, blow-by, compression loss, power decline, rough shift, overheat, leak and such not-normal trouble. Have any car RV to commercial equipment engine transmission, radiator, power steering, power take-off, a/c and gear, axle, bearing and seal fix remedy. Add your email address here... Thanx! Then the site opens up for your remedy usage and phone help. Join the thousands coming to this site for the best alternative problem solving engine transmission radiator steering or a/c mechanical problems chemically. Best becausethis optionends your car, pickup, diesel truck, tractor, boat, motorcycle, or machine wear and tear, mechanical, running, performance problems. "What's wrong with my vehicle? "What are the alternatives to repair? "Will this auto tune up-and repair option assure its repair avoidable and guaranteed?" My logic for these options. Vehicles, like humans when ill in a major or minor way need medicine and often a doctor to decide what forms of medicine - is needed. This is our option for your car! It identifies exactly what do to prevent a major health problem, to avoid a problem from turning into a major problem, keep your problem under control, as an aid to end them. If you read this far, its time to be rewarded for that effort. this is what you really need to know how and why what to do to gain these options to end youre car trouble. This option, on the page you are shown to go to corrects your wear and tear, mechanical, running, performance problem - correcting such in any engine transmission radiator cooling system and machinery - chemically - really! Join the thousands coming to this site for what turned out to be their best alternative problem solving engine transmission radiator steering or a/c mechanical problem-solver. And why so and, how? Did you know 95 out of 100 vehicle internal problems are friction, or residue started? In time, friction, and or residue causes dozens of running, noise, performance decline negatives - one of them you are here for help with, we have the best option for its fix! Did you know special friction and residue removing products are reversing those negatives to slam the brakes on the problem, ending them - avoiding their repair need? The ones we selected also provide a great return to former great driving dependability. Actual repairs can't do that! Nothing to take a apart! That's a great option hundreds of thousands have found to be their best and cheapest car fix. Sure, I know it hard to believe, but read the testimonials. Those car owners have the same problem and we fix it easily, cheaply, permanently. To find your repair option, immediate help and valuable tips just sign up for our email auto tune up and repair options alternative newsletter. Contains repair avoidance tips, better repair methods, products needed, and car care deals worth thousands of dollars - FREE! NO SPAM! Privacy Notice assures you we will keep your info private and secure. Of course broken parts need actual replacement. What does this option do for me? We searched the world and found, most times - 95 times out of 100 times problems caused by carbon, sticky residues, sludge, oil blockage, or friction, and binding causes some part or parts to change negatively. That's why this is a better, faster, cheaper option for you. Mechanic's can dismantle, clean, and reinstall those parts - replacing those that failed from such stress, as the fix. That is good, but very costly as lower cost options are just as good, but way cheaper. That our option for you! With science, chemistry, and me now providing products - known as treatments that do the fix better - as you drive! you have the country's expert on this! And this is the option that works for your wear residue problems, I'll help you select, install and get running great again!. The chemistry, by cleaning, conditioning, and coating rebuilds every worn or half worn part where ever air, fuel, combustion, exhaust, an oil goes. Many thousands of car equipment owner everyday use these Auto tune up and repair options as their fix. Fix and protect your car pickup, diesel truck, tractor, boat, or motorcycle - engine, transmission, radiator, steering, or tune up problem by adding what I show you to the fuel or fluid - and then driving ends the problem! Your tune and repair option contain the most powerful cleaners, lube aids, anti-size, freeing, and slippery coating combinations found to end the problem! Sure, some repair shops and mechanics come here for additive education. They learn how and what to use here, too! However, thousands of non-mechanically men and women, besides mechanics - have ended their engine transmission radiator and steering problem, at a fraction of the normal cost using our auto tune up and repair option. Its tomorrows Hi-tech way to dos - today! Do a little reading and the education will show you what to do. Nothing to take apart, or harmful. The exact option needed to end your specific car or equipment problem is given. To find the option and best remedy to your car problem - the title of the article list it - see table of contents at bottom of page. Or, click link buttons at left side of page. And just below are popular pages you can check. Each option includes powerful anti-wear ingredients that reverse the cause of the problem - to end it. Easy install details the install given, plus free phone help. All guaranteed to end your vehicle trouble. "Those are your best options!" Read a few pages to learn a little about car care an avoiding such problesm - and our remedy you can order there, or by calling me. email me, and me or my people will help you with suggestions we know will be a good shortcut to mend your car problem, and the products needed. We ship most any where. What you want to know is, why this claim offers your best solution? After reading a bit, you will see these auto tune up and repair options offered compared to most other sites, are the best way to end your car pickup diesel truck tractor RV boat motorcycle gen or machine - engine transmission steering radiator and fuel problem. The reason is you get results way better and impressive, they happen much faster, an are 90% cheaper - - but part stores, quick lubes, and most mechanics don't want you to know about them. That's mostly because mechanics see results from rip off additives that increase the harm, and so feel all additives are that way. Those that give ours a 3 month chance change their mind and agree ours is the best around. It shouldn't take you more than a day of driving to think so! For many ordinary men and women use my auto tune up and repair options for their car equipment fix, not just mechanics. Those who like holistic, conservative long-term car care thinkers. Not for throw-away and buy-new thinkers and promoters. Our car-fixing, car care philosophy. Who buys it? Our repair shops and fleet owners and just regular car and equipment owner customers love the car care philosophy and help me and Mega Power provides them. Such people and conscientious repair shops want to provide 101% percent Mega Power inclusion to take care of every dirty worn part for longer car life - not just replace bad ones, collect, and let your luck help you takes care of those other parts. I hope I'm selling you on the idea this is different and way better way to solve your vehicle problem and its long term trouble-free care for your cars, equipment, for worry reduction about this problem, and as your best budget protector. is my auto tune up and repair option fix difficult to use? No! Though they are performing complex actions - read about them on your fix page info, that unravel, then recondition chemically to end your vehicles problem. Assure great running trouble-free performance for you from them on. Yet, they are easy and simple to install. And driving does the actual fix. Nothing to take apart! What they fix. Good things to know about just in case. A car or equipment's running, performance problem in the engine transmission power steering radiator a/c and gears. like in 4x4's. They stop tap, oil burning, blowby, rough idle, engine miss, backfire, oil leaks, and also rebuild friction and their rough running problems. They will become the best fuel injector cleaning and Tune up you’ll ever get! They end rough shift, slow shift, hang up, slippage, shutter at 45 miles per hour converter problems, seal leaks and other dirty or worn hang ups. Head gasket problems, and anti-freeze mysterious loss problems. Anti-freeze leaks. Overheating, in traffic, or when towing. Steering whine, rough turning of the steering and its leaks. Rack and pinion hang ups. Tow chain and cable hangups. Hydraulic power take off unit troubles. Gear growl, whine, hard to get into one of the gears hangups. overheating gear or differentials. Hot running wheel bearings. Of over several hundred problem solving features, those are the most common ones. Got it! I suggest reading a few pages to see how easy my fix procedure is, what people say. Remember! No wrenches needed. Just add what’s shown and drive. OK! Sorry to give you so much detail. But that's why I'm a different kind of mechanic. You need to know, I know how to help you for what your vehicles need. They end fuel waste, lack of power, and exhaust smoke problems. by addition of this product treatment we found, and improved upon to end many other internal problems. Worn engines and transmissions and other components having a tap, oil burning, blowby, power decline, rough shift, fluid leak, overheating, steering whine and all such wear sludge cause problems - or to prevent avoidable ones. Our auto tune up and repair avoiding or tune repair enhancements , will have your car run great again, and for years trouble-free. This is explained on the page you go to how Research discovered problem solving chemistry and created products that do so. Us, long term users of this product know that! All that and more - to benefit you, family, your finances, your vehicles, and equipment. It would be what most people would invent to avoid actual repair of their engine transmission steering or cooling system if they could. We did! This option offers chemical repair of mechanical troubled parts that could fail completely, and turn into a costly repair. They work to end those above mentioned negatives - while you drive. They work in brand new to even worn out vehicles. Sure, there are other products sold as a fix, however, I feel you’ will join the tens of thousands that chose our option instead, because of their high success rate and high built-in safety factor. And customers tell us, “they return the former great reason why you bought that car or equipment – again permitting years more driving usage, when replacement would have been the norm – years earlier. That's really what you're after - right? Those are my auto tune up and repair options. For exact tips, and my product recommendation, find them on the page you will go to. Content Page Titles, and links below, and buttons on the left show vehicle the negative you have and want fixed. Of course, if something is actually broken, other sites will help you with that. Here, our option ends the problem to avoid that situation. If that’s what you’re after, spent 10 to 20 minutes reading around the site to see how much there is to help you – with specifics to end your car problems. Each is field tested and in daily use. Each tip suggestions directions and product needed are field tested and guaranteed repeatable in your car. They are all Do-It-Yourself remedies. Nothing to take apart as driving caused the problem. Driving makes our options work – That’s the genius in them! Sold money back if not as advertised! Just look over this list, and, or the content pages below to find your auto tune up and repair fix option. And call me if you prefer that method of ordering. Your auto tune up and repair option is guaranteed and I’m personally here to assure you of that goal. If not satisfied- the purchase is free to you the buyer! Please note: 2 refunds last 267 days. know will be a good shortcut, and the products needed. We ship most any where. Secrets worth knowing some mechanics don't want you to know. great again, and for years with-out-overhauling. All that and more - to benefit you, family, vehicles, equipment, finances. tune up and repair options page will appear with the info you need. Your new page covers your symptoms, wear and performance problems and my repair method. A cause-remedy explanation and products to use are given. - Wish simple solutions could offer similar results for us humans? ....Anyhow, the remedy's suggested are successfully followed by many satisfied motorist. Your friends and neighbors will wonder how you do it. alternatives when others require expensive repair or replacement! 1- Bookmark me to find me easily. What's here for your fix? Here is an easy, fast-acting alternative-to-repair product to end your car's engine transmission radiator steering and a/c running, performance problem? Few of the problems easily remedied with this option. Like leakage, valve tap, oil burning, sludge removal, rough shift, and such wear, residue, Hi-mileage problems? Those are the fix I call an option that avoids repair, or makes for a superior repair to get you back on the road of life again -trouble-free - for years longer. Spend 10 minutes reading - may save you $10,000 over your life time. Gain the fix you need right now! Take a few minutes to learn what what we learned about products - I call treatments, from science and chemistry that end those engine transmission radiator steering and a/c problems - possibly the one you're looking for for your car. you and your families vehicles run better cheaper, longer - all the rest of its life! As it also ends the negative deep inside your car causing you a running leak, shift or performance problem. Who should read more of what's below? One Mega Power Engine Treatment below. Shipped to your door in 3 days with easy to follow directions, phone help, guarantee. Just $80 +$15s&h= $95. What Mike says about his auto tune up and repair options fix. Hi George, I have to say that the improvement with the engine of my 2005 Explorer has been miraculous. It is actually quieter than when I purchased the Explorer in 2005. I Googled and found your product as an engine remedy to end a nasty ticking valve lifter noise - mechanics wanted up to $3247.59 for its fix. With your method, valve ticking subsided within ten minutes. And for under $100! Thanks for the products and tips...Patrick Carrabino. "When I did this one little thing - george told me to do, my 12 year old motor went from noisy clatter to a sweet, smooth, musical purr." I have my neighbors, impressed, and using George's products now to help their cars avoid troubles prematurely! ...Mike H. Read Mikes experience and the worry our tips and products eliminated by doing the fix - avoiding a real repair. My customers are amazed their cars run so well after being repair by us. The use of George's Mega Power engine transmission radiator power steering an a/c treatments are the reason why. They produce unexpected amazing performance customers love! You can type in your car/equipment problem in the space bar and let Google find the page you need. Or look for links or buttons with the subject info you need - or call me - that's what I'm here for. Subscribe by paying for 12 months in advance. Save $20. Just $100 total. After the payment, you are given the button to gain access to the entire site and its benefits... and me by phone if you need me. You'll smile too if you try the auto-tune-up-and-repair-options to end your car problem. Mega Power picture shows how it ends valve tap, oil burning, smoke, blowby, rough idle. You have a guaranteed product remedy to end your present problem. Whether you are looking to solve a specific problem, or simply want to learn more about a topic you are passionate about, auto-tune-up-and-repair-options.com is the place for you! Subscribing NOW before the price triples, for just a $10 a month, or $100 for a full year. Both ways provide a full value site subscription. Discounts, our 100% money back guarantee, 3 day shipping, phone help anytime. Mega Power Transmission Treatment order online below. Shipped to your door in 3 days with easy to follow directions, phone help, guarantee. Just $75 + $15s&h=$90 total. Order the Mega Power Engine $95, and Transmission Treatment $90 below. Both just $185. Now Just $135 plus $15s&h= $150 total. Save $35. As featured in Fixya.com. Congratulations Geo Christ! You're in the top 10%. With 612 people helped, you're one of the most popular answerers of Honda questions. Keep those great answers coming, George. 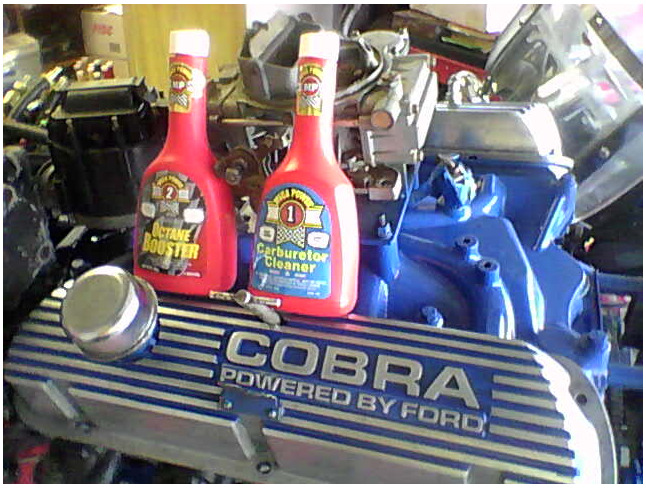 Mega Power, a noisy engine valve treatment stops noisy engine valve tap or free! Add to motor. Drive to end tap. Avoids engine repair for good! Mega Power's Motor Blowby Treatment ends compression blow-by in any motor! Stops oil burning, oil leaks, valve tap. Restores like-new power with MC+ avoids overhaul. Guaranteed! Easy sludge removal method proves its superior, providing a quick, clean, strong motor performance to keep you going. Avoids expensive repair. Engine flush tips, types and brand ratings? Most engine flush additives should be installed and engine ran cautiously. We found the Mega Power Engine treatment among the best performing. Its protectors allow you to drive while cleaning ensues. Performance recovery is second to none! This Worn Motor Treatment. Gives new life to worn motors, instantly! Auto tune up checklist shows what product ends miss, stalling, rough idle, power loss, oil burning, tap, lousy mileage, for a perfect auto tune up. Mega Power Tune up Products; recovers horsepower ending performance problems. Review. Need transmission help? New product ends rough shift, jerk, slip, leak, chatter. Goes where oil, other products cannot to end problem. Transmission slipping additive. End the slip problem now!. New product ends 3 causes transmission slipping. Does so removing varnish on clutches, pump shift pressure, cleaning sticky shift valves. Tips Products. Premium Power Steering Treatment that ends jerky turning, turn hang up, squeal, leak. Restore smooth steering, turning. Avoids repair. Radiator cooling system service: stops head gasket, manifold, heater core leaks. Overheating. Coolant loss. Simple to install, instant results, cool exciter and stop leak included, guaranteed. Mega Power Diesel Motor Treatment ends oil burning and blue and black exhaust smoke even in older worn engines. Diesel Injector Cleaner by Mega Power. How this cleaner stops smoke an rough idle caused by dirty injectors and valves. This diesel engine tapping noise product stops valve tapping for instantly quieter, smoother operation. Just add and drive to stop tapping! Racing engine additives Zinc? Friction Modifiers? Octane boost? Which racing engine additives get you to the finish line oftener? Those that reduce the most friction, send the most horsepower to the wheels! Is an engine oil flush harmful? They say so on the label. This one is not! Is an engine oil flush harmful to your motor? Most are! This one is not! The new flush treatment from Mega Power cleans and revitalizes a motor in minutes or free. Mega Power Worn Motor Directions Restores your motor's power. Valve sticking, tap help. WikiAnswers, quote, tips. Fast-acting products to end valve problems, end rough idling, rough running, restore power. Radiator servicing. New, stronger system flush, stop leak, and cooling conditioners. Acid an Anti-rust Removers. Tech tips. Order online. Transmission remedies. Use these additives that work! Thee transmission remedies end leaking, rough shift, slip, converter lockup. Under $100 Simple service & product you use avoids $2000 repair. We selected Mega Power Transmission Flush with anti-wear because it ends shift, chatter, leaks. Cools, conditions. Avoids repair. Clean your dirty fuel injectors and dirty engine valves, and other dirty trouble makers, at the same time. New engine tune up product ends internal starting, power loss, engine miss, idle, lousy mileage tune up phone help, Ordering options. Engine transmission fuel injector repair tips to find, remove hidden power consumers,. Ends 21 tune up problems, 3 of the toughest shift problems. Your older car medicine and vitamins. Chrisman Legacy Always Faster. The book. J Leno. The Chrisman Legacy Always Faster - the book Interview; J Leno, Ed Justice Jr cover the race car legend Art Chrisman. The book. Garage owner tips. Learn more. Sell more. marketing.tips. $1000 more every month. Steps to have more customers buy more, oftener. Dyno tuning, using additives to recover and squeeze out extra horsepower. Not octane boost! "Conditioning" provides instant zip like a bigger motor. Tire smoking race car power improvers. 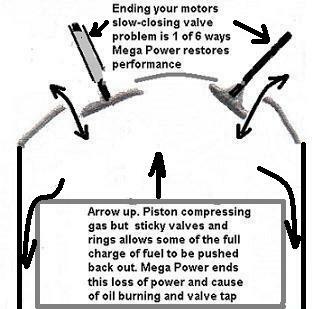 Mega Power stops motor oil burning fast. Add, drive. Driving quickly stops oil burning, exhaust smoke, oil consumption using new oil n wear conditioners to block oil escape. Worn Motor Treatment Review. Gives years more life to any engine. Worn Motor Treatment Review: Help, tips, products that avoid costly engine overhaul. Ends tapping, oil burning. Restores years more usage from older, high mileage cars and equipment. Mega Power Testimonial. "After years of neglect, Mega Power has given my little pickup has more power, and better fuel mileage than I can remember it ever having before." Lucas Oil. Good or Bad? What people say about Lucas. Lucas Oil Additives Lucas negatives and positives compared to: Mega Power. I sell additives. Feedback on Lucas. What oil treatment will work best for your motor? Lucas transmission, stop leak. How does it compare? If not safe, what could I use to help my transmission along? 3 tips for transmission care, repair avoidance. Other brands to compare. New Transmission Additive with 3 new anti-wears frees sticky shift valves to stop rough shift slip leak any transmission or free, guaranteed! wiki.answers Did Lucas worsen my transmission problem? wiki.answers Did Lucas worsen my transmission problem? Things you should know about the difference between quality & poor quality additives. Review. Amsoil Engine Flush. Why I don't trust it. What missing? What's harmful in it? A good engine flush has these 6 ingredients. End Valve Tap Fast This New, Quiet Engine Treatment Way. End your engine valve tap and sticky noise problem with this Mega Power Product that ends tapping. Do so as you drive. Saves your engine and money! Car additive brand comparison chart. Popular brands compared. Car additive brand comparison chart. List of dis-advantages of different motor oil treatments. Who ranks #1. Lucas, STP, MOA, Restore, Mega Power, Slick 50? Which tune up is best for your motor? What you should know. Basic or Complex? Steps to each. Tuneup additives. Future tune, repair problem avoidance guide. Are octane boost additives helpful? View this test-lab video. Top brands tested. Review. Products to boost power by removing octane lowering, power robbing, motor, transmission negatives. Solvent based additives sold for engine & transmission flushes are harmful. Better, safer brands reviewed. Which are which explained? Need your motor oil flush ed? Which method is best - worst? New motor oil flush 10 times better than common motor oil flush products. Mega Power's New Flush Treatment ends 6 motor problems. Mega Power Transmission Stop Leak. Works, or free! Controlled seal expansion closes gap and stops leaks. My 10 cold weather, cranking, engine starting, running tips. End slow start, rough idle, stall, tap. Winter engine care for great engine starting, running, performance. Cold starting problem. How to start you engine in freezing weather. Cold starting problems end with these 5, How to start your car in freezing weather, easily. With these four items. This new air conditioner tuneup tip will cool and quiet your hot compressor to instantly cool as it should using Mega Power Tuneup Lube #120. End your engine runs rough idling problem easily. Here's a powerful internal valve cleaning product to do the job. Easy to install. Quick acting. Ends Rough Shifting Automatic Transmission Problem Fast. Cheaper, too! End your leaky, rough shifting automatic transmission problem fast yourself, avoid a $2000 repair that may not entirely end the problem this will. End your sticky transmission shift problems with this powerful cleaner conditioner. Clean and friction modifies to return smooth shifting again. Cleans your car rusty radiator fast. Simple DIY product. Removes rust. Cooler car radiator when towing. Ends hot running temperature rise. Best boat fuel additives for every type boat fuel blend, usage. Best boat fuel additives. This brand is so strong, motors just last longer. Gives your boat motor& carburetor a tuneup via the fuel. New. A under $100 transmission slipping fix from Mega Power. Pour-in-n-drive. Stops transmission leaks, rough shift, slipping. Avoids $2000 repair. Stopping head gasket leak fast. New head gasket stop leak from Mega Power works fast. Non clogging. Seals when exposed to air. Online ordering. Classic Car Additives. Just add these to prevent and end fuel motor transmission classic car fuel, storeing, cranking, running and shift problems. Got an A C cooling problem? This method and product ends your A C cooling problem. It tunes and restores your cooling system - keeping you cool on the hottest day. Avoids an expensive repair. Mega Power Distributor Options: Provides a profitable new income producing tune and repair products mechanics can only buy from you each month. $5000 Investment. What is The Best Engine Oil Additive for a High Mileage Engine? New high mileage engine additive gives high mileage engines years more dependable service. Additive works in 6 motor areas not just oil. Equipment additives. Ends high mile motor transmission problems. How to blown head gasket repair in 2 easy steps. Car Club Forum. Spread Club News. Show Off Your Classic Car Pic Here. Car club forum: News, events, car pictures. Your favorite car likes, dislikes.This Car Club Forum, an extra link web page for your Club News. Show Off Cars in Your Club. Boat engine troubleshooting.Tune up your engine. Enjoy easier starts, higher speeds. Lower repair cost. End your Ford truck engine valve tap taping in minutes. Add. Drive. Ends tap for good! Avoids an expensive Ford engine valve tap repair. End your stick shift transmission problem. Again enjoy smooth easy shifting each gear. 4X4 shift aid. Ends growl. Overheating. New problem-solving engine transmission additives works fast! End problems wear and tear causes. GETS YOU BACK ON THE ROAD with help from special anti-wear ingredients like MC+. This engine sludge removing treatment restores your motor's health! Oil additives for heavy equipment. Keeps them working! Oil additives for heavy equipment.ending oil burning, valve tapping, blowby, black exhaust problems..
New product stops your oil burning motor problem in 3 troublesome places, not one. Just add and drive. Resultds work in any size engine, gas or diesel. This new blowby motor fix also ends your gasket and seal leak. Ends oil burning, power loss, and tapping. Last for years with small touch up. Puts off overhaul, some say. Racing additives pass-thru more horsepower, remvoe hot spots, reduce metal migration, transfer heat outward faster for longer periods of time, lower friction in 2 ways. They give the edge you need! Mega Power Distributor Opportunity. Local Business Opportunity. For more info, call 512 665 3388. A local way to supply auto service and lube businesses a monthly supply of products they need. Auto tune up options blog. Find your repair avoidance tips,help, products. End oil burning, tap noise, blowby, returns dependable operation quickly. Diesel Hi mileage help products to control oil burning. Works by cleaning sticky piston rings and filling worn surfaces, limiting oil's escape! Alan Fincke Testimonial My1998 Lexus LS400, 1985 Toyota camper Again run great thanks to Mega Power additives. This hot radiator fix product ends overheating, stops leaks, lower temperature. Easy to install. Guaranteed results.